Choosing the correct holster has been written about by so many but I would like to approach the subject from the prospective of John Q Public (me before I started making concealed carry holsters). A little background about myself first. I was brought up around guns all my life. My father taught us from an early age to have a great respect / fear (yes they are the same) for firearms. I started out hunting and target shooting. After moving out on my own I started shooting Ipsic with my Dad as something that we could do together. I have always enjoyed handgun shooting but I do not consider my self anything but an adequate shot. Years ago I applied for and received a CCW Permit to carry while target practicing and hunting (anything else in Michigan was hard to get back then). During this time of my life I was young enough that I thought that I was a 110 pound 5’6” indestructible man. I now know better. Due to circumstances, I no longer shoot competitively; the cost of 2000 rounds of .40 SW a month was just too much. I still put at least 300 to 500 rounds through the handgun a month just to keep my skills or bad habits. As most know, Michigan is now a must-issue state so I applied and received my CPL and started my search for the holster that met all of my requirements. And the story begins. During the CPL class the instructor said the best handgun to carry is the biggest gun you can carry and shoot well. So I did that. First I started like most I decided what gun I wanted to carry purchased it and asked the clerk what holster I should buy for concealed carry. Since I had spent all of my savings on the biggest gun I thought I could carry and shoot well, I did not have much left for a holster, so like every one else, I purchased an uncle-mikes IWB ($12.95). How may mistakes do you count so far? The first day was a nightmare; the gun kept moving around in my pants and I kept re-adjusting it (can you say I HAVE A GUN any better?). The first time I went to the bathroom and dropped my pants, the gun hit the ground. Every time I sat down, I either got pinched or the gun would squirt out of the holster and again I would be re-adjusting. I was constantly touching the gun just to keep it in position. Holster one in the “Holster box” and the start to my list of requirements. The holster had to stay in place all day. The gun would stay in the holster even when in the bathroom. This time a Fobus paddle holster ($48.32 on sale). It was winter and I figured that concealment wouldn’t be a problem because “I could wear a coat and I really didn’t need to carry all the time” . The Paddle holster has great retention of the gun and wasn’t too bad in the bathroom (I still felt better taking the gun out and putting it in my coat pocket before dropping trou). For the most part, the holster didn’t move on the belt but sitting could produce some major pinching especially in the car. After a month or so, I just started leaving the gun home all the time because it was so much headache to carry. It was too hard to conceal all the time. After reading hundreds of articles by experts my list grows. I have to be able to conceal the gun no matter how I am dressed. I considered carrying a smaller gun, so off to the Gun show to find a holster for my Colt .380. So many choices and no real direction so I purchased an ankle holster and a pocket holster and a leather “summer heat” style IWB total of $145.00. Now for trial and error. The ankle holster first … it concealed well but summer time and shorts will be a problem. The left leg always felt heavy, and I was always fidgeting with the pant leg but better than the Paddle holster. I didn’t feel comfortable running with it but I am in my 40’s now, so probably not a big deal. Then came the trip to the range to practice my draw and presentation. The draw is so slow and bending down to retrieve the gun can put you so off balance, that shot placement suffers. Holster two for the .380 Pocket holster. This met all of my needs. It was a little awkward and I couldn’t put anything else in that pocket (like most guys, I carry car keys, pocket knife, lighter, change, thumb drive), This is what is always in my pockets (as every good boy scout should). Trip to the range; presentation – relativity quick and accurate; re-holstering almost impossible but not a deal killer. Re-loads – oh wait I didn’t think about that – with only 7 rounds and a very small caliber – better than nothing but not perfect. Still pinches while sitting, unless it is in a cargo pocket and then presentation really suffers. Holster three for .380 the “Summer Heat IWB” long story short – very comfortable, stays in place and holds the gun well, except in the bathroom – the pants sag and I was always worried about it hitting the ground. Presentation was exceptional and I could carry a spare mag in the pants pocket. I can wear the gun all the time but to dress up I can not tuck my shirt in (Darn). Summer time isn’t really a problem – the shorts are cargo style anyway, so just put on a belt and I am good. So bathroom solution? Have to dress up some times? Compromise? Most people stop here and say “carrying a gun is supposed to be comforting not comfortable”. I decided that I wanted to start carrying my “biggest gun” that I had spent so much money on and so I ordered a “summer heat IWB” style holster for it $65.00 on ebay and started carrying my big gun. My Dad took the CPL class with me and was working this same process at the same time. He tried the cheap cloth and kidex, then he tried a leather paddle holster with a plastic paddle. This seemed to be the only solution for him because a few years ago, he had cancer (he is in remission now)and because of the treatments, his skin around his waist was very sensitive and he could not carry IWB. The plastic paddle irritated some but was better than anything he had found. He also purchased a few smaller guns to pocket-carry. After discussing what problems my dad was having and spending many hours searching on line looking for an all-leather Paddle Holster , I decided to take things in to my own hands, and make one for him. Having a Paddle made of leather allowed it to mold to his body and didn’t pinch or irritate like the plastic did. I was still looking for the perfect holster that met all of my needs but had resigned myself to the fact that I wouldn’t find it. But because I had leather left over from making my dad’s holster (it took a few prototypes), I started playing with the summer heat design to modify it to meet all the requirements. I kept searching and finally developed the Invisi-Tuck design. This holster meets all of my requirements, including keeping the gun in the holster in the bathroom without worry. There is not another holster maker making a holster like this in all leather for the price I do because it takes me at least 8 hours to make one holster. If your holster can not meet all six requirements you may be just settling or compromising. You can have comforting and comfortable at the same time. Jay, I like what I’ve read. I’m simular to you, 5’7″ & 150 and would like to always carry. Do you make holsters for a KelTec PF9? I normally carry at the 2 oclock, but would like to switch to crossdraw while driving. Any suggestions? Yes I can make any of my holsters for the KelTec PF9 I do not make a cross draw holster because it is difficult to make that style holster properly so you can draw safely and have proper retention. The only holster that I make that can be used in both positions would be the leather LEC Paddle holster because the paddle can be adjusted for forward or reverse cant. This would require you to have a screwdriver to make the adjustment but it could be used. 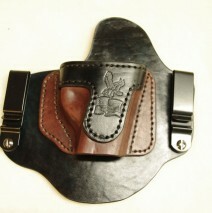 If you are looking for a concealment holster I recommend the Leather Invisi-Tuck IWB holster. I reccomend that you to change your carry position to the 3:30-4:00 o’clock position this will allow you to carry in the same place while seated or standing and with practice will be a safer draw and presentation of the firearm.